Born in Milan, Italy; he was a disciple and pupil of Leonardo da Vinci. He worked on the Milan cathedral. 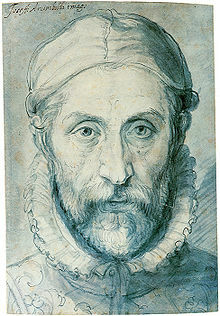 In 1562 he went to Prague as a titular portrait painter of the Imperial court. For 27 years he tirelessly depicted the faces, tastes and manners of the emperors Ferdinand I, Maximilian II and Rudolph II, as well as their wives, children and courtiers. For his services, he was made a margrave, He returned to his native Milan toward the end of his life, and he died there in 1593. 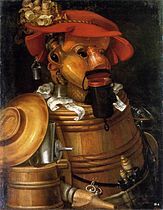 Arcimboldo is known as the inventor of a “color keyboard”, although his work was for a long time relegated to obscurity. He was rediscovered after World War I by the Surrealists, who regarded his fantastic paintings one of the links in the chain leading to surrealism. 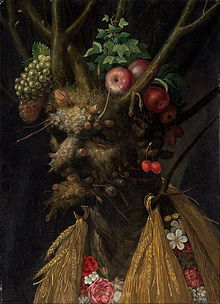 Arcimboldo’s “composite heads” can also be seen as both a statement on the art of caricature and an attempt to transcend it; it’s grotesque animals are forerunners of one of the more fertile trends in cartooning. 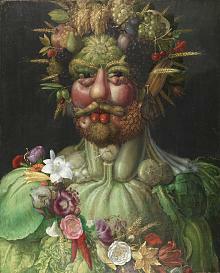 Obviously Arcimboldo was not a caricaturist in the strict sense, and his favourite medium was oil, not pen and ink. He has, nevertheless, left us a legacy upon which to ponder and echoes of his works can be found in some of the research carried on by modern cartoonists like Saul Steinberg and Michel Folon.